Peak Financial Consulting was founded with the goal of assisting our clients in every aspect of their financial lives. We strive to provide the most comprehensive and personal service available and earn a reputation for excellence in our industry. For each of our clients we strive to create financial stability, security and peace of mind. For more information, please contact one of our CFP® professionals. Check the background of your financial professional on Investment Adviser Public Disclosure. All written content on this site is for informational purposes only. Opinions expressed herein are solely those of Peak Financial Consulting, Inc. and our editorial staff. Material presented is believed to be from reliable sources; however , we make no representations as to its accuracy or completeness. All information and ideas should be discusses in detail with your individual adviser prior to implementation. 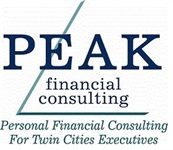 Advisory services are offered by Peak Financial Consulting, Inc. a Registered Investment Advisor in the State of Minnesota. Insurance products and services also offered through Peak Financial Consulting, Inc. Peak Financial Consulting, Inc. is not affiliated with or endorsed by the Social Security Administration or any government agency, and is not engaged in the practice of law. The presence of this web site shall in no way be construed or interpreted as a solicitation to sell or offer to sell advisory services to any residents of any State other than the State of Minnesota or where otherwise legally permitted. You should always consult an attorney or tax professional regarding your specific legal or tax situation.